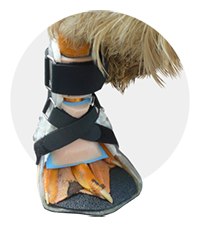 While PawsAbility primarily sees dogs, other types of animals can and have been fitted for orthotic and prosthetic devices. Several cats; a goat; a duck; a rabbit; and a pony have all been seen at PawsAbility. In addition to different species, unique and one-of-a-kind devices have also been made. Devices that fall outside of the traditional brace types are a welcome challenge and PawsAbility invites all inquires.